This being the month in which we celebrate Valentine’s Day, I thought it would be a good time to discuss using email to show some love to your customers. Chocolates and flowers are nice, but aren’t they a bit overplayed? Here are some ways to surprise and delight your subscribers via email – and not just during the month of February! Zapier has tips posted here for how to use Shopify and Stripe with Gmail to send personalized thank you notes. Even if you don’t make use of that platform, tailored thank you notes after a purchase are a way to reinforce your brand’s personality with someone you’ve just done business with and show appreciation for their business. Cards Against Humanity is well known for its personality. The below is a note I was sent after placing an order. It’s a great example of a simple design that says a lot succinctly. An easy way to make someone smile is with a surprise “How are you doing?” inquiry. If someone has purchased a “beginner’s set” or an entry-level item, asking how they’re liking it will engender some goodwill and make your store their likely go-to when they’re ready to upgrade. (You can’t just ask, you also have to listen to their answer and be open to beginning a dialogue when they write back!) Even an unsolicited note with a link to a tutorial video, say for a new bike trainer or grill, can go along way. Think this would be time-consuming? Nah, such messages can be automated through ESPs such as MailChimp, Salesforce or Silverpop. Customers expect to be notified when their order is on the way. Send a little love by including something extra in it. The example below from RoadID has some trivia about my place of residence – which was easy to pull in from my shipping information. 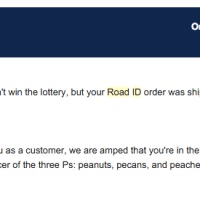 I got a kick out of their thinking to include a little something extra besides a link to my tracking number. Here’s another RoadID example of showing some love: a treat for me for spreading the love about their company – with a side of personality thrown in. 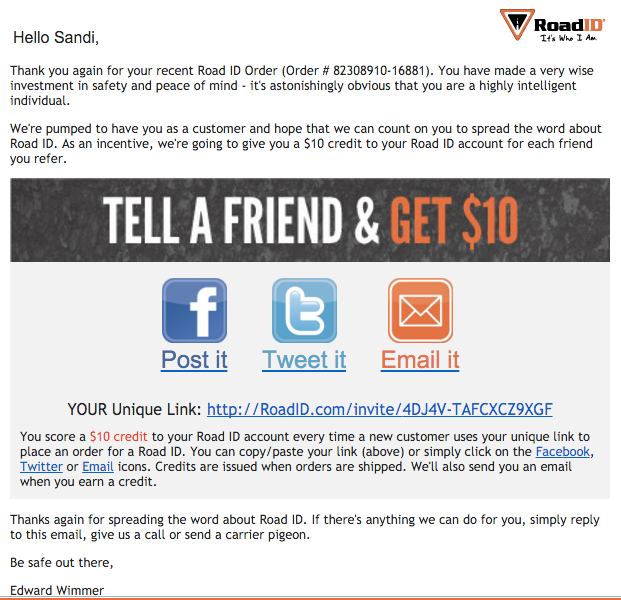 RoadID went beyond just including social share icons in their email – they understand you have to give a little love for getting some in return. Thanks in advance for your interest in my newsletter. A form with more fields will pop up after you hit submit.